Tap, slide, and shake to the beat! 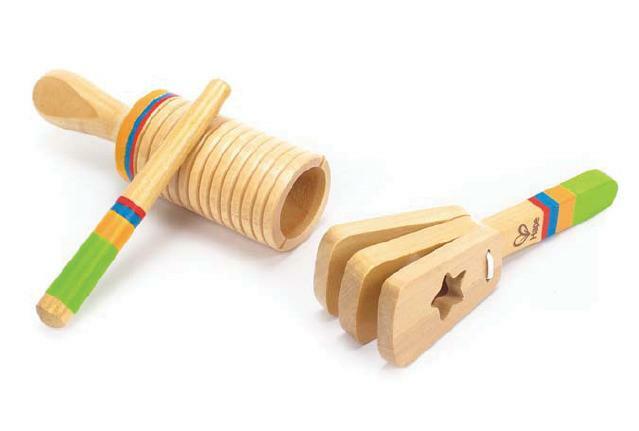 The Rhythm Instrument Set is comprised of a clapper and a guiro ready to provide hours of entertainment. Encourages children to develop rhythmic and melodic abilities as they discover the world of music at their fingertips. Made from wood sourced from environmentally sustainable forests and has a durable child-safe paint finish. Dimensions: L: 1.6" x W: 1.6" x H: 5.1"
The picture made me think they were bigger then what they really are.